What Does MCMLXXXVI Mean on a Coin? I have a gold coin from the U.S. that has a denomination of $5, $10, $25, or $50 but the gold coin has no date on it. Instead, it has something like MCMLXXXVI. What does this mean? 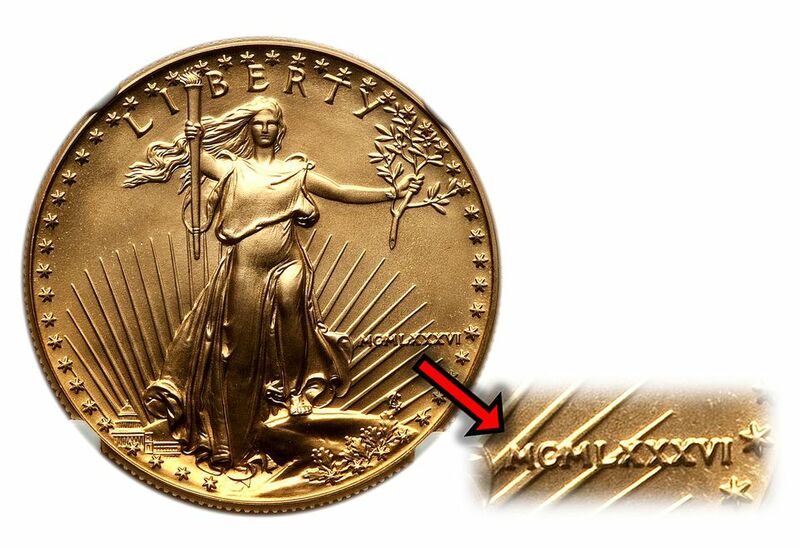 One of the first United States gold coins to use Roman Numerals was the 1907 Saint-Gaudens Double Eagle. The artist who designed this coin, Augustus Saint-Gaudens, leading an effort to revive the artistic aspect of United States coinage. He wanted to give our coinage a more "classical" look and feel. Therefore, he used Roman numerals to indicate the coins date. In 1986 the United States Mint started producing gold coins to appeal to precious metal bullion investors. They decided to revive the classic design of Augusta Saint-Gaudens twenty dollar gold coins. During the first few years of the American Eagle gold bullion coin program, the U.S. Mint did not use standard dates on the coins. Instead, the date was given in Roman numerals. Beginning in 1992, the dates on U.S. gold coins began appearing in normal digits on all United States coins. In 1907, the U.S. Mint issued both high relief and ultra-high relief double eagle gold coins designed by legendary sculptor Augustus Saint-Gaudens. These coins also had Roman numeral dates on them, which appear as MCMVII. The 1907 twenty dollar gold coins with Roman numerals are extremely rare and were minted in several varieties. The ultra-high relief coin with the plain edge is unique and is valued at $3 million. Twenty-two ultra-high relief 1907 coins were produced with a lettered edge and are valued at $2.5 million. 12,367 high relief coins with a Roman Numeral date were produced and values range from $9,000 - $25,000. When the American Eagle gold bullion coins were first issued, the designers tried to reproduce Augustus Saint-Gaudens' original design. This included specifying the date using Roman numerals. Just as in the original series the use of Roman numerals in the date was short-lived. Beginning with the coins issued in 1992 Western or Arabic numerals were used to indicate the date of production. The U.S. Mint will issue a special one-year Ultra-High Relief Saint-Gaudens gold double eagle (twenty-dollar gold piece) in 2009. This coin will also have the date given in Roman numerals as MMIX. This gold coin is a tribute to the original ultra-high relief double eagles first issued in 1907. The "tails" sides of these coins are different than the American Eagles described above. Double eagle gold coins have the denomination spelled out as TWENTY DOLLARS. Why Aren't Roman Numerals Used Anymore? Although there isn't a law that dictates the use of Arabic nor Roman Numerals, the artists at the United States Mint, with the approval of the Secretary of the Treasury, may use whatever numerals they see fit. Mostly, Roman numerals were used as a means of artistic expression. Unfortunately, most people in the United States cannot translate Roman numerals in their head. Therefore, the trend has been to use Arabic numerals since that is the standard numbering system of the United States. Someday another artist at The United States Mint may choose to use Roman numerals once again.